Thanks to modern medicine, we are living a lot longer with chronic illnesses. Most of us will eventually need help from another person, often for many years, just to get through the day. Today, family caregivers provide about 80 percent of care needed by older and disabled persons, delivering meals, taking loved ones to doctor’s visits and managing medications. Evidence shows that for many caregivers, this results in lost work hours or lost jobs, financial strains, high stress levels and significant declines in physical and mental health. Having a relative with a serious illness is responsible for 60% of personal bankruptcies in the United States. 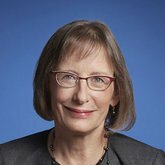 The National Academy of Sciences released a long-awaited report last week, Families Caring for an Aging America, on the more than 17 million family caregivers for older persons, underscoring the profound public health implications of the unspoken and implicit societal reliance on families to do this work. 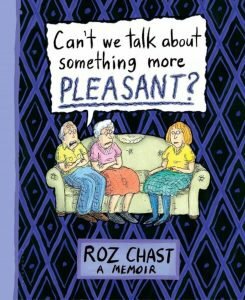 In 2014, Roz Chast—an American cartoonist most known for her work in The New Yorker—brought her unique brand of storytelling to the topic of her aging parents, for whom she was primary caregiver in the last years of their lives. In her memoir, Can’t We Talk About Something More Pleasant?, Chast used art and humor to portray her experiences as a caregiver as her parents (both in their 90s) dealt with the symptoms of many chronic illnesses, including dementia, diverticulitis, incontinence, partial blindness, hip fracture, bedsores, pneumonia, high blood pressure, general weakness, and frailty. In addition to the many physical issues, Chast’s mother was completely unwilling to talk about the implications of her illnesses and the emotional toll they were taking on everyone involved. In a recent interview, Chast shared her perspective about this highly personal but also universal experience. “I ‘let’ my parents live independently until even they saw that it was becoming impossible,” says Chast, an only child and the only caregiver throughout her parents’ illnesses. Chast has lingering regrets that communication remained difficult even at the end. “I wish I had asked my parents more questions about their pasts,” says Chast. Her parents’ refusal to talk openly about their illnesses, what to expect, and how they wanted to handle it, meant that Chast had to do a lot of the decision making herself as they declined. This experience has shaped her plans for how she approaches her own aging. “I think once you go through the death of your parents, one’s own inevitable death becomes less abstract. I don’t want to leave too much unorganized stuff for my kids to deal with when the time comes,” says Chast. Mary Tibbats is a caregiver to her 88-year-old mother Mary Nolan, who has diabetes. After a rehab stay, she went into congestive heart failure. In a recent podcast, Mary shares how palliative care not only helped her coordinate her mother’s care and improve her mother’s quality of life, but also provided support to Mary as she dealt with her own burnout and exhaustion. Also featured in the episode is Dr. Leanne Yanni, Director of Palliative Care at the Bon Secours Richmond Health System and a member of Mary’s palliative care team, on the role that it played in supporting both Mary and her mother. In-depth communication with people facing serious illness and their families is essential to understanding what matters most to them. This information is prerequisite to the provision of high-quality care. But supporting family caregivers requires not only expert communication skills but also conduct of formal caregiver needs assessment, as well as the ability to identify and secure the community resources necessary to support them. CAPC offers online training in supporting family caregivers and in strengthening the communication skills necessary to learn about who they are and how we can best be of help. Examples include “Delivering Serious News” and “Supporting the Family Caregiver: The Burden of Serious Illness”. To learn more about these and other CAPC Member resources, click here.